Last night AJR took me to a Redskins game. While there, I was dying to get some cotton candy. 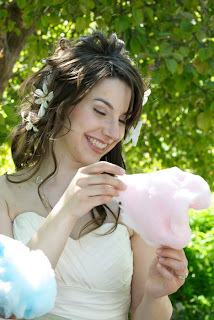 Ecstatic with my sugar rush I exclaimed, "Omigosh, I LOVE cotton candy! Can we please have it at our wedding?!?!" To which he replied with a small shake of a head and a "um. no." How serious was he about that no?